Updated, Nov. 20 | You see them all day long — cabbies parked in bike lanes checking their phones or driving while searching for their next fare on their devices. Today’s app-based systems basically require New York City taxi drivers to be on their phones almost constantly. Yet the NYPD wrote just 41 tickets in the first nine months of this year to cabbies violating this basic safety rule, according to data provided by the Taxi and Limousine Commission. That’s fewer than five tickets per month. Total. From 77 police precincts citywide. And it’s not that the problem isn’t happening. The Taxi and Limousine Commission’s 175 or so enforcement agents wrote 5,259 tickets for drivers violating 80-14(g) over the same nine-month period this year that the NYPD wrote just 41 tickets. And the Port Authority Police, who patrol predominantly at the airports, wrote 1,102 such tickets this year, again according to the TLC — up from just 73 over the same period last year. These tickets are literally life-savers. It’s unclear exactly how many of the 171,000 crashes between Jan. 1, 2018 and Sept. 30, 2018 were strictly the result of a driver on a phone, but city data cited “driver inattention/distraction” as the cause of 39,870 or 23 percent. And of the 33,304 crashes that resulted in injuries, inattention and distraction was the cause of 8,221 or 25 percent. Any way you cut it, drivers who operate vehicles while on their phones are a safety menace. But in a city where tens of thousands of Uber, Lyft, Via and other app-based drivers are required to manipulate their devices as part of their job, cabs are an even bigger threat. Anecdotally, cyclists, pedestrians and cab passengers logged scores of complaints about phone-juggling cabbies on the Reported app — evidence that the NYPD could easily be writing dozens of tickets a day, not just 41 in nine months. Scrolling through the app’s data stream — which Reported shared with Streetsblog under the agreement that users would not be identified by name — is like plucking the lowest-hanging fruit of Vision Zero. “As I was riding north on Sixth Avenue in the protected bike lane I saw the driver holding and looking at a cellphone in one hand while making a turn onto 19th St.” one Reported app user posted earlier this year, echoing a fairly common complaint. Driver was looking down at phone while driving on west side highway. Driver is watching YouTube clips while driving on his phone on this dash. Driver was scrolling through his news feed on his cell phone while driving and waiting in traffic. … This happens way too often. During the drive, he missed several lights and swerved in and out of lanes nearly rear-ending cars because he was texting. We asked him on several occasions to stop texting because we were concerned about our safety and he refused. He kept taking on and off his glasses it appeared he needed the glasses to text but couldn’t drive with them. Cars repeatedly honked at him for swerving and missing lights changing. Driver was obviously texting and driving, her head was down looking at her phone while driving across 106th St. 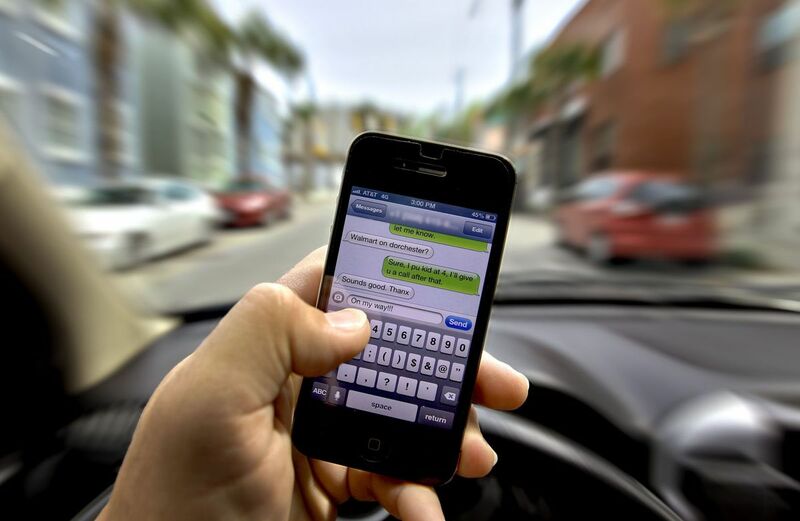 This is distracted driving and it is illegal. Driver failed to yield to pedestrian waiting to cross in a marked crosswalk where there is a yield to pedestrian sign. She was also clearly on her phone looking down. This is extremely dangerous driving behavior. Ran a red light into a busy pedestrian crosswalk. Using his phone while driving in his right hand as he pushed his way through the crosswalk. Want the best example of what happens when drivers are distracted by their phones? Read the 2015 lawsuit against Uber driver Aliou Diallo and the taxi company after Diallo ran over and killed Wesley Randall Mensing on the Upper East Side (court document below). The case, which is now sealed, specifically cites the Uber app as a contributing factor to the death because Diallo was on his phone at the time of the crash. The Taxi and Limousine Commission says it prioritizes 80-14(g), but its numbers this year are 13 percent off the same period last year. Still, the agency is writing far more tickets than the NYPD, which admitted that it doesn’t take the issue seriously enough. Fewer than 25 officers? Out of a force of more than 38,000? You do the math. That’s not enough cops dedicated to one of the simplest ways of keeping cyclists, pedestrians and drivers safe. The NYPD declined to answer further questions. I’m gonna go ahead and assume that CIVILIANS using the Reported_NYC app have gotten more cab drivers ticketed than the entire NYPD over the last year. We’re basically doing the job that the NYPD is too lazy and incompetent and corrupt to do themselves. Disband the NYPD and rebuild it from scratch with better people. Am I reading this right, 171,000 crashes in 9 months? Any mode of transportation which crashes that often should be shut down post-haste by the NTSB. So busy saving lives by writing tickets to bicyclists for riding with two earphones, they can’t go after giant cabs and SUVS being driven by guys texting. You don’t need NYPD to do anything (they are too lazy and won’t). Easier would be to have the TLC mandate the apps not allow touch screen input while the GPS is detecting motion. The TLC used to mandate functionality like this during the days of MDT (radio based mobile dispatch terminals). Daily News on Distracted Cab Drivers: What’s the Big Deal? Why do Fernando Cabrera and Ruben Diaz Sr. want to gut a Taxi and Limousine Commission enforcement tool?